A University of New Brunswick professor and alumnus helped Team Canada achieve a gold-medal victory at the IIHF World Juniors Ice Hockey Championship in Buffalo, N.Y. by keeping their minds focused and confidence high. Dr. Ryan Hamilton, an associate professor of psychology at UNB’s Fredericton campus since 2013, served as mental performance coach for Canada’s world juniors from Dec. 10 to Jan. 5. “My job was to keep the players and staff focused on the game and not on outside factors,” says Dr. Hamilton. The players face a lot of pressure from family, friends and fans across the country to be victorious and maintain the legacy of Hockey Canada – not to mention the NHL scouts that hold their future careers in their hands. He worked alongside the staff, coaches, managers and players for 28 days, making sure they were feeling relaxed, focused, and confident in their ability to meet any challenge presented to them. “We took tremendous effort and consideration in to protecting our players from outside variables so that they could make the best use of their time,” says Dr. Hamilton. One of his goals was getting the young players, most of whom had never played together before, to come together as a team – important not only to the game but for easing the pressure players feel. “Buying into the team concept protects you from personal stress because you’re sharing the weight of that stress with 21 other people,” he says. Working as a team and sharing that weight lead Team Canada to a 3 - 1 gold-medal win against Sweden on Jan. 5, 2018. Growing up in Plaster Rock, N.B., Dr. Hamilton watched the World Juniors with his family; they went as far as to schedule holiday plans around when Team Canada was playing. “I never really considered ever being part of Team Canada an option until I started to develop some connections with the organization, but when I did, the World Juniors became my goal,” he says. This isn’t his first time being a mental performance coach for a major team – he also works as a sports psychologist for an undisclosed NHL team. Dr. Hamilton has obtained his bachelor of arts in psychology (2000), masters of sports and exercise science (2003) and PhD in experimental and applied psychology (2011) – all from UNB. During his master’s degree, he gained his first client as a mental performance coach – the UNB Varsity Reds wrestling team in 2000. He has since worked with other V-Reds teams, including most recently helping UNB men’s hockey team to victory in nationals in 2017. 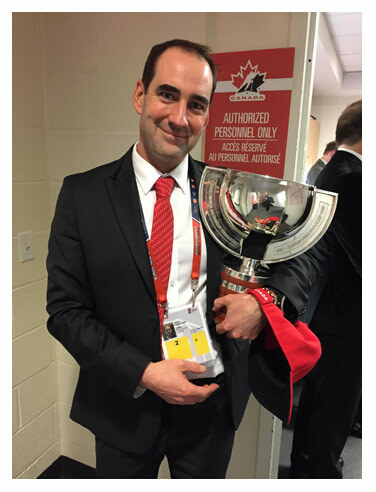 Working alongside Team Canada and an NHL team are honourable accolades and provide a lot of experience in high-stakes situations, but Dr. Hamilton attributes his greatest success to UNB. Photo: Dr. Ryan Hamilton celebrating after Team Canada’s gold-medal victory.